Inspired by Chris to create an image, I've made a video. Only because I couldn't think of a still image, but rather something that was arrived at. So thanks to Chris and Elena, I've discovered a new tool, VideoScribe. Chris invited us to contribute to his flickr group by creating an image of "what a MOOC means to you". Well at the moment, I'm only thinking about edcMOOC, although I am enrolled in another one, to which I have given absolutely no thought. My vision is going up to a friendly place in the cloud where we can do all this wonderful stuff together through edcMOOC and have fun and achieve some inspirational results. 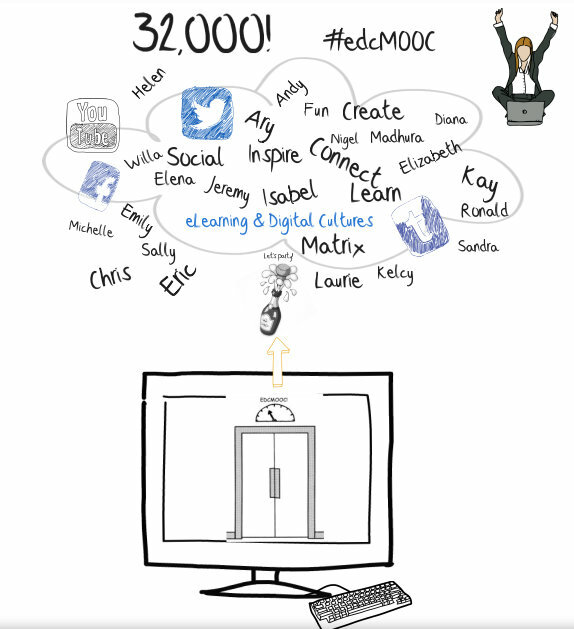 So here is my image, this is what MOOC means to me right at this moment. I had to stop adding names, because it was getting out of hand, but everyone who is engaging in the course is in my heart, sorry I couldn't put all our names there! This was a hell of a challenge for me. I can't draw, and whilst I am a keen photographer and enjoy capturing images, I'm hopeless at creating them. So I'm grateful for the prompt to do something along these lines. I've also been struggling with my disappointment at not being able to create a sketch video as Kyle showed us (sorry Kyle, just realised your name isn't in my pic), due to no sketching skills. So when I saw Elena's video, it looked like the tool meant for me. Took a couple of hours to master, there are great tutorials on youtube. I hope I can make another one while I am on a roll, because there is a lot of potential do do some pretty good things once you get the hang of it. I did encounter a few issues with freezing, and developing some camera view skills to make it smoother is something I will need to work on. But all in all, a right brain task for a very left brain person....I'm reasonably happy with my first throw. My son thinks it is cheesy. We are a bit cheesy. That's just fine by me! Wow! Your creativity is so inspiring, Angela! My initial intention was to learn more about technologies of distance teaching with the help of this course. And when I observe this process of learning from each other, I'm thinking about how to apply it in my everyday teaching practice. I'm learning so much from you and people you've mentioned in your video that this course has already become successful for me even before its beginning. Thanks guys. Elena, even if I don't start the course, like you, I have learned so much from everyone already, it would be enough! I'm not very creative, that's the point, videoscribe does it all for you. I had this kind of multiverse concept of edcMOOC, and I wanted to create an image of a world within a world within a world, but that was way beyond my capability to represent visually, but the video is another way of thinking of it, so that's fine too. That's the thing Andy, not too much talent needed with videoscribe. I think it is more about the visualising the concept you are trying to convey, then the software does most of the work. Check out Marhura's creation, she has made a kind of animated mind map, you could use it in this way too. Remember, you can impost images and it will draw them, so you can make your mind map more than just text and the images available in the videoscribe library. I've got a playlist happening, so I'll add your when you send me the link!!!!! Love it! I concur with all who mentioned that we are learning about all types of apps and ideas before this class has started. You did an excellent job. Can innovation and compliance coexist? "All the world's a MOOC, and all the men and women merely teachers and learners." Martin King Learning Technologist & New Media Consultant.